The Fiat 600 Multipla isn’t one of the sexiest cars ever built – far from it. But it did have a solid layout and drivetrain – enough to move nearly a quarter of a million of them off dealer lots between 1956 and 1969. The Fiat 500 and 600 were the basis for quite a variety of “beach cars” built for wealthy people who didn’t need something practical for everyday driving, but for a way to get from the front door to the ocean. So when Fiat president Gianni Agnelli wanted a car for just that purpose, Pinin Farina took a 600 Multipla, widened it a little, and crafted this really pretty open-air little transporter. It is powered by a 962cc straight-four (mounted at the rear) making 50 horsepower. It features an early-Econoline setup with the driver essentially riding the windshield, but it’s quite pretty. It has a very Cary Grant-in-1950s-Italy sort of feel about it, doesn’t it? Agnelli’s Eden Roc premiered at the 1956 Paris Motor Show and it caught the eye of an American oil man who commissioned another example (this one). It’s had two owners (both of the same family) since new and was restored sometime post-2008. Both examples still exist but this is likely the only one that will ever be available. No pre-sale estimate is available as there is no sale history for this model. Click here for more info and here for more from this sale. 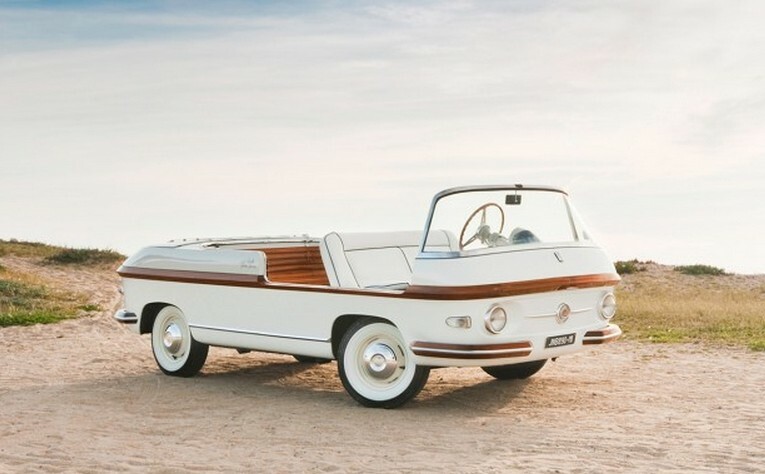 This entry was posted in Uncategorized and tagged 1956, auctions, cars, classic cars, eden roc, fiat, gooding & company, pinin farina by classiccarweekly. Bookmark the permalink.